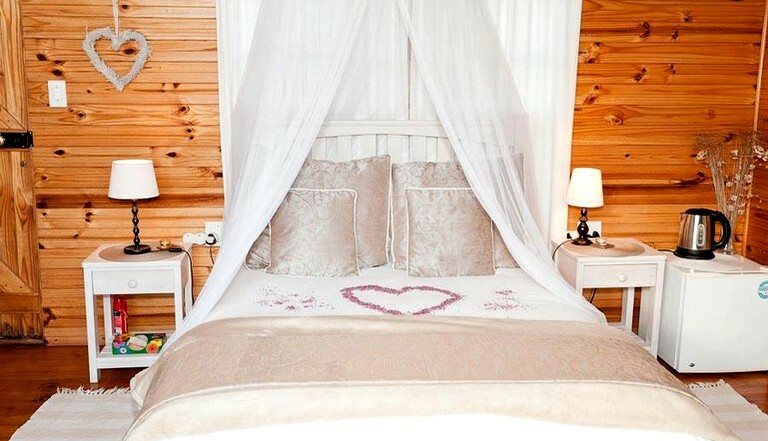 Choose from luxury romantic tree houses, luxury tree lodge or fully equipped self catering cottages. Whatever accommodation suits guests, their guaranteed a warm welcome and a unique vacation. Luxury Tree Houses: These romantic, secluded tree houses offer guests a luxury accommodation combined with awe inspiring views. 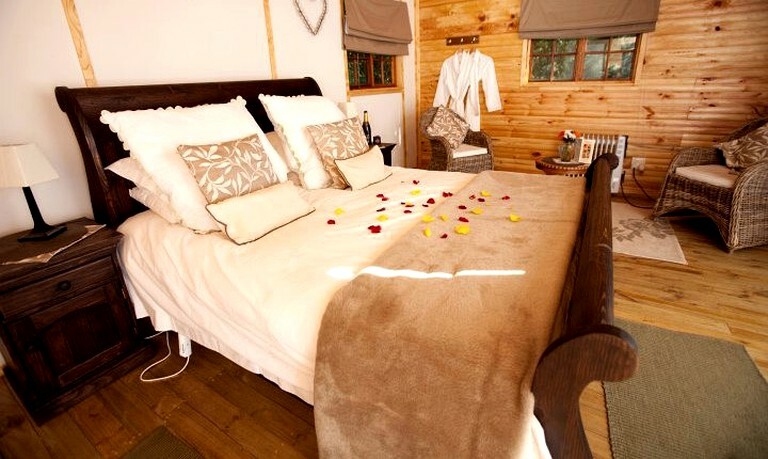 Each tree house sleeps two people and has a full en-suite bathroom including a large spa bath, fine linen, tea and coffee facilities and romantic ambiance. 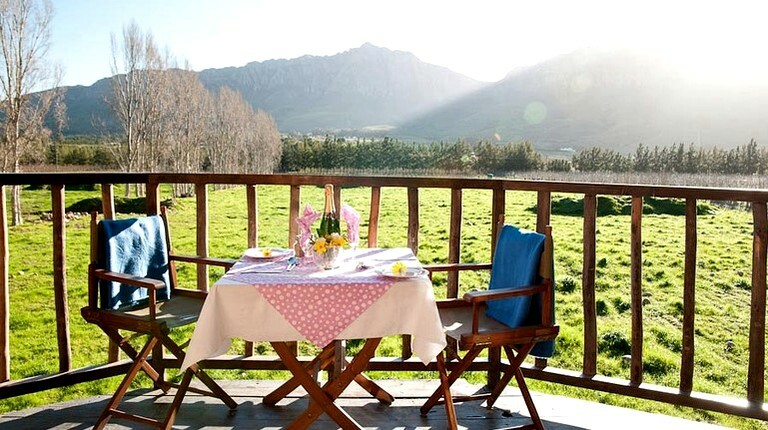 Guests will enjoy a light breakfast or evening sundowner on their private tree top balcony overlooking the orchards, game camp and majestic Saronsberg Mountain. For a little extra romance guests can order a delicious three course dinner delivered to their room to be enjoyed under the stars. Please note all tree houses are slightly different, but to the same high standard, and may not look exactly like the pictures. Honeymoon Suite: The luxury tree house honeymoon suite is the perfect place for guests to kick off their time together, or just for an extra special treat. 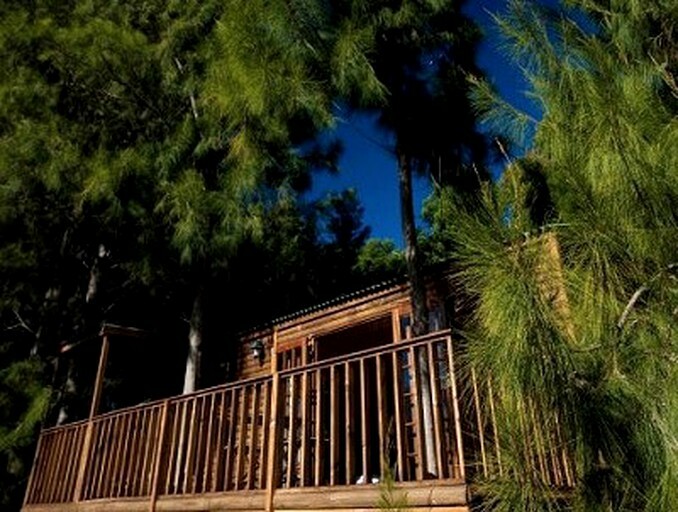 Larger than the other tree houses, it is set in forestry, private and has an indoor seating area and larger bathroom. It also has a covered area on the balcony for rainy days. With the best view of the watering hole guests can enjoy watching the beautiful local animals. Luxury Self Catering Tree Lodge: Whether guests are looking for a family holiday or break away with friends, this luxury tree lodge is the ideal place. Sleeping four to eight people, it is a home away from home. It boasts three bedrooms (two ensuite) each with Juliet balconies and beds that can be king size or twin, double sleeper couch, bathroom with shower and bath, spacious open plan kitchen and living room with roll up floor to ceiling blinds for endless views, television, DVD player and decoder (please bring own card) plus an enclosed private garden with braai area and pool. Dining at the Deli: Dinners served Friday – Sunday. Supper platters and dinner picnics available Monday – Thursday. Picnics and take-aways available daily. If you are looking for a relaxing break, without leaving the farm our on-site, the Deli is here to provide you with delicious homemade dishes for you to enjoy in your room or one of our picnic sites. Tree House guests can enjoy a romantic 2 or 3 course dinner at a time that suits you served on your own private balcony or by the pool. Homemade snacks and lunches are also available to order. All ingredients are locally sourced and are of the finest quality. Just let them know if you have any special requirements and they will try to cater for you. They also stock a selection of local wine and other beverages at reasonable prices. Your choice of breakfast is ordered when you check in and is delivered at a time to suit you the following morning – breakfast in bed, no problem! Or maybe poolside on warm summer mornings? They serve both cooked and cold choices. Their self catering guests are not forgotten! Having a family weekend and don’t know what to cook for the kids? Order one of their homemade meals, simply warm in the oven! They also have a take-away snack menu and can provide breakfast baskets with all you need to prepare a continental breakfast. Braai packs from the local butchery can be purchased at the deli to be enjoyed at one of their braai areas. They can also provide fresh bread, salad and drinks. Picnics: They offer a few picnic options from gourmet to fun for the kids, all contain delicious home-made goodies and a little bit of love! Dining Alfresco:This site has 3 large braai areas for guests to use. The first is in the main garden next to the 15m swimming pool surrounded by beautiful trees. This is the perfect spot for small groups and tree house guests to enjoy a relaxed braai. If you are looking for something a little larger they have a large boma braai area at the self catering cottages, complete with 3 braais and a large central fire place. This is ideal for large groups and family gatherings. This glamping site is a family run farm only 90 minutes from Cape Town that offers guests a unique opportunity to stay on a working fruit farm while relaxing and being pampered. Located just 5 Km from the center of historic Tulbagh the farm is surrounded by some of the most beautiful scenery in the Cape. It is home to the only luxury tree houses in the Western Cape, each with stunning views over the orchards and Saronsberg Mountains. 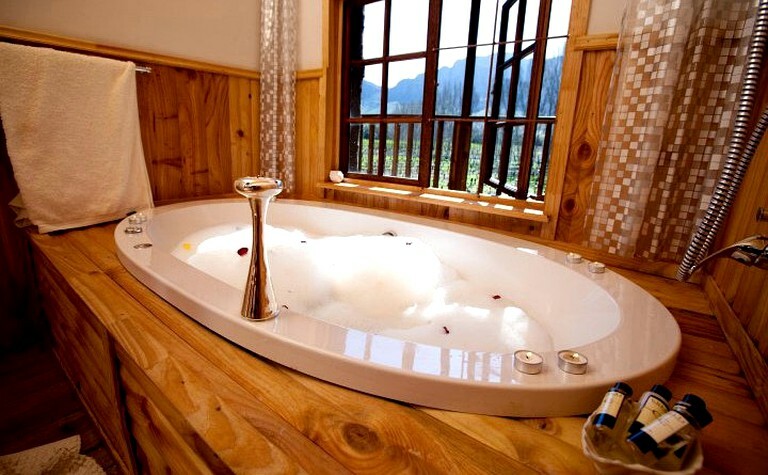 They also have a luxury self-catering tree lodge, rustic self-catering cottages, a Day Spa, a gym, on-site dining and function hall. Take time to, spot some wildlife including zebra and wildebeest, try a little fishing in the nearby dam, or simply relax along side the pool in their manicured gardens. Day Spa-provides you with a personal spa experience like no other. Their highly qualified therapists will guide you through your healing journey with expert hands. Their treatments are Fynbos inspired giving them a unique feel and aroma. 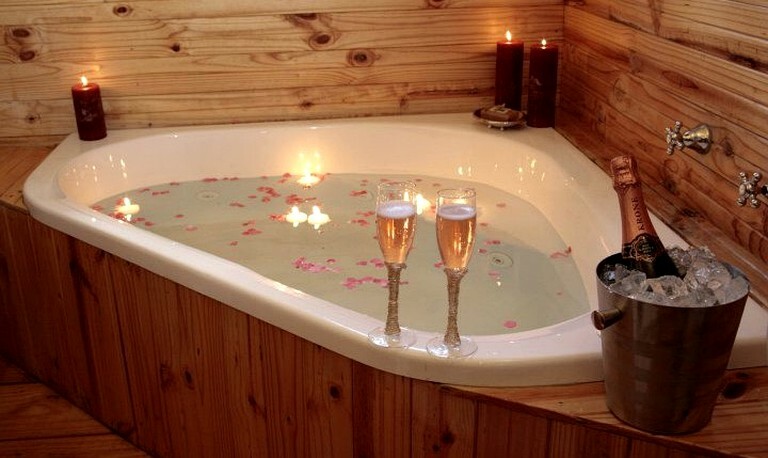 Share your spa experience with a loved one in their couples treatment room or prepare for the gift of life with a pregnancy massage on a specialized bed. 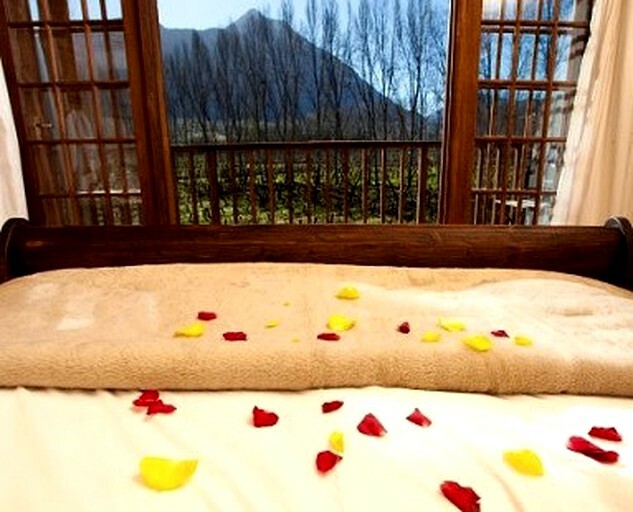 Their Philosophy: To promote healing of the mind and body through natural therapies tailor-made to suit your needs. With this site you are not just another client, you are the focus of all their energy. All their Fynbos Therapy body wraps and massage blends are hand made using the finest essential oils from the area, assuring you a quality product with no harmful additives. Whether you want a quick pick me up or a day of pampering they can make a package to suit your needs! 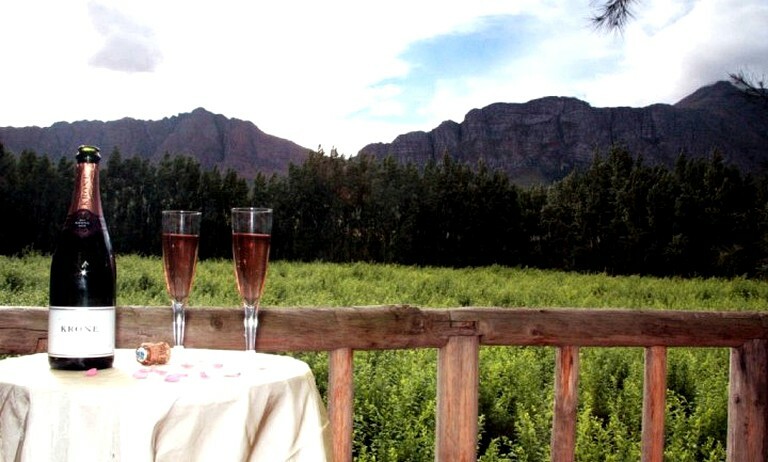 Bridal Services: The Tulbagh Valley boasts some of the most beautiful wedding venues in the Boland, so the staff is here to make sure you are looking and feeling a million dollars for your big day! They provide professional hair and make-up services along with all your other pampering needs. Spa days can be arranged and hair and make-up can be done at your venue or in your accommodation. Pool & Game Viewing: This site boasts the largest pool in Tulbagh, measuring 15 meters x 8 meters x 2.4 meters deep. It is naturally heated by Tulbagh’s glorious summer sun. The pool area is a real suntrap, set in stunning surroundings. From the pool you can also get a good view of the game camp. Nothing lifts the spirit like the sight of grazing zebra! They have recently introduced 3 zebra (with a little one on the way) a couple of springbok and 4 black wildebeest, they are getting used to people and can be easily viewed while you enjoy a picnic at the pool. Gym: Their gym has all you need to keep the holiday flab at bay including a good selection of cardio equipment, weights and an infra-red sauna. Use of the gym is free for guests. “The Village Hall” Function Venue: Whether you are looking for an intimate garden wedding or a place to celebrate a birthday or even a small conference venue their newly renovated “village hall” is perfect! Seating up to 50 people it has beautiful vineyard views and large braai area close by. They can provide catering and decor or you can simply hire the hall. Wine by Bike Cycle Hire: What better way to enjoy this beautiful valley than by bike? They offer 1/2 and full day cycle hire leaving you free to enjoy the numerous farm roads through orchards or nearby wine farms. Hire includes helmets and water and your bike is equipted with a wine carrier for any purchases. Dam Fishing: The large dam across the road from the main farm is well stocked with carp and bass and is also home to countless species of birds including Fish Eagles, Blue Cranes and many water fowl species. They have fishing rods and tackle to hire. Museums: Tulbagh has 3 wonderful museums for you to visit including the earthquake museum on Historical Church street documenting the 1969 earthquake along with other interesting facts about Tulbagh. The Great Outdoors: For those whole like to be out in the veld enjoying nature at its best, Tulbagh has hiking trails, fishing, horse riding and canoeing to offer. The Waterfall: this is a must see for nature enthusiasts! Only 8km drive from the site this beautiful waterfall is only a 15 minute walk from the parking and has lovely pools to swim in all year round. Hiking: Other hiking trails include Mulundi trails which offers a 10km or 4km hike in the beautiful Winterhoek. Permits can be bought at the tourism office or on the farm itself. Silwerfontein just outside Tulbagh has 1 and 2 day guided trails to caves along with boating and fishing in their large dam. Horseback Riding: A unique riding experience for beginners and more advanced riders. Beautiful trails and lovely horses. Please note this site has a minimum stay of two nights over weekends and public holidays in the tree house accommodation. Reception hours are Mondays to Thursdays from 8:00 am to 5:00 pm and Fridays to Sundays 8:00 am to 8:00 pm. Special arrangements need to be made for check in after these times.